Our country was born 241 years ago, when our Founding Fathers adopted the Declaration of Independence. The story that we tell ourselves, of our birth and who we are as a country, has been a continuous thread since then – the story of the American Dream. We tell ourselves that, in our country, there is equal opportunity for everyone – no matter where they are born or who they are. We tell ourselves that we have long been a country that is welcoming to everyone. That we are many states united, where the fate of each person is intertwined with the fate of all of us – that we value loyalty, to our neighbors and to our country. That’s the story we tell ourselves. 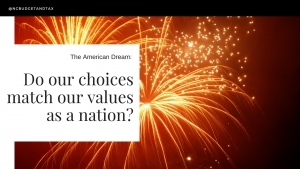 But then there’s the reality of the choices we make, of how things are – and how things could be if our choices actually reflected our values as a country. If we made choices as a state and as a country that were in line with the values of the American Dream, every worker would make a living wage and the discrimination that drives differences in wages for women and men, Blacks and whites would be addressed. Black women wouldn’t have to work hard to make only 68 cents for every dollar that white men make. If we made choices that reflected the values we say our nation was founded on, every person would be welcome in every community, no matter their gender, sexual orientation, race, or country of origin. We would acknowledge that immigrants bring economic benefits to all of us. And know that strengthening opportunity for one will strengthen the economy for us all – that growing inequality and a failure to broaden opportunity will weaken the economy, slow growth and hurt us all. If we made choices as a state and as a country that moved us toward the American Dream for everyone, we would make sure that all of our neighbors have enough to eat, access to good schools and health care, and the opportunity to make sure the next generation can move up and have a better life. Where someone is born wouldn’t make a difference in their access to opportunity and ability to achieve security. We would see it as our patriotic duty to make sure our country is better as a whole by making sure each individual living here can access the American Dream. That means investing in and designing policies that widen the circle of opportunity, not narrow it. Our story for more than 200 years has been that everyone deserves a shot at the American Dream. As we reflect this Fourth of July on our great nation, it’s time to start making the choices to help make that story a reality. Mel Umbarger is the Senior Communications Specialist for the Budget & Tax Center, a project of the NC Justice Center.